Last week, after meaningful discussion, the County Council was able to beat two important deadlines by passing bills to approve the Maui Island Plan implementation program and the county’s annual budget. The council faced a May 29 deadline to pass Bill 29, which approves the implementation priorities for Maui’s long-term planning goals, on second and final reading. Over the course of four Planning Committee meetings, a prior council meeting and a public hearing, the council received substantial testimony, reflecting an array of viewpoints. Ultimately, the council decided to honor the deadline and pass the bill on May 27, while also referring back to committee numerous proposals to amend the freshly minted implementation program, based on public comments. As a veteran of the process – first an interested member of the public and then as a council member – I can attest that the various deadlines established throughout the county’s decadelong general plan update have helped ensure that the necessary ordinances actually get enacted. By their very nature, planning policies are always subject to further debate. But if they’re never adopted, they can serve no purpose. The council’s obligation is to allow ample opportunities for the public to testify on important issues and then give the council members themselves the chance for thorough, robust deliberations, leading to action. A leader must acknowledge open-ended indecision means inaction. At its May 27 meeting, the council passed on first reading Bills 31 through 37, cumulatively approving a $604 million budget for fiscal year 2015. The deadline for the council to take final action on the fiscal year 2015 budget is June 10. 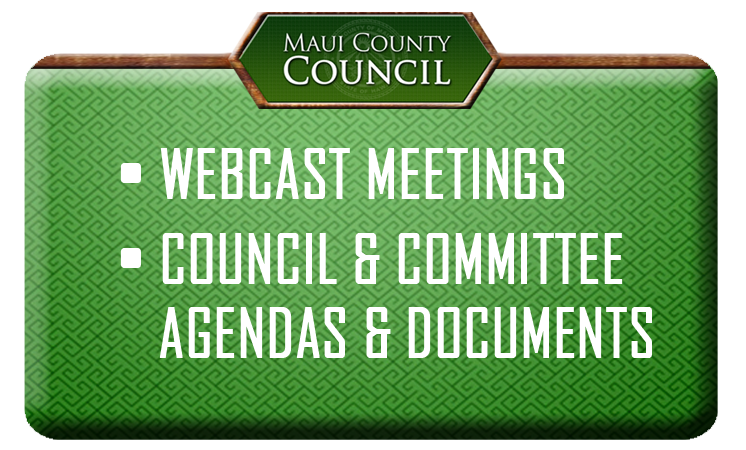 If you didn’t participate in the Budget and Finance Committee’s exhaustive deliberations this spring, you can still testify on the budget at Friday’s council meeting. Of course, even if you’ve already testified, you’re encouraged to share any final comments you have. Another big – and timely – decision at the most recent council meeting was passing Bills 38 and 39, granting conditional development entitlements to the state for the proposed new high school in Kihei. Though there’s no official deadline for these bills, council members were anxious to act, effectively imposing on themselves a deadline to keep the project moving. The Land Use Committee recommended passage of the legislation way back in October. As council chair, I had to wait more than six months to schedule the bills on first reading as the state studied and then, finally, officially agreed to the zoning conditions. Amendments to the zoning conditions were considered at the council meeting. But that would’ve meant again submitting them to the state for further review – and the council decided the community could no longer wait for the project’s formal development approval. Talk about a Kihei high school has been happening since at least the late 1990s. Testifiers – as well as commentators in the newspaper and on social media – clamored for council approval, though students aren’t expected on campus for years. I reminded colleagues of the importance of moving forward. Delay can be debilitating. * Gladys Baisa is chairwoman of the Maui County Council and holds the council’s Pukalani-Kula-Ulupalakua area residency seat. “Chair’s 3 Minutes” is a weekly column to explain the latest news on county legislative matters.